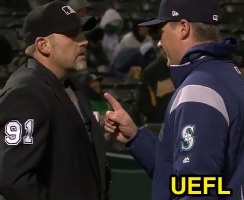 HP Umpire Brian Knight ejected Mariners Manager Scott Servais (strike three call; QOCY) in the top of the 9th inning of the Mariners-Athletics game. With two out and one on (R2), Mariners batter Ben Gamel took a 2-2 slider from A's pitcher Blake Treinen for a called third strike. Replays indicate the pitch was located over the heart of home plate and at the midpoint (px 0.017, pz 3.458 [sz_top 3.319 / RAD 3.444 / MOE 3.527]), the call was correct. * At the time of the ejection, the game was tied, 2-2. The Mariners ultimately won the contest, 3-2, in 10 innings. This is Brian Knight (91)'s first ejection of 2018. Brian Knight now has 3 points in the UEFL Standings (-1 Prev + 2 MLB + 2 Correct Call = 3). Crew Chief Brian O'Nora now has 2 points in Crew Division (1 Previous + 1 Correct Call = 2). *This pitch was located 0.828 vertical inches from being deemed an incorrect call. This is the 47th ejection of the 2018 MLB regular season. This is the 19th Manager ejection of 2018. This is Seattle's 2nd ejection of 2018, 1st in the AL West (SEA 2; HOU, LAA, TEX 1; OAK 0). This is Scott Servais' 2nd ejection of 2018, 1st since May 15 (Jeff Nelson; QOC = Y [Interference NC]). This is Brian Knight's first ejection since July 2, 2016 (Chip Hale; QOC = N [Balls/Strikes]).